This recipe has been in the Costa side of my family, in one form or another, since at least the beginning of the last centruy, when my maternal grandmother began making it after she emigrated from the Azores to the States in 1920 as an 18-year-old newlywed. 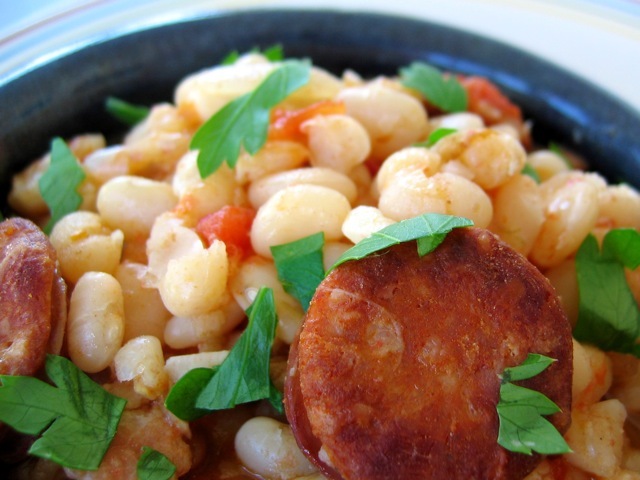 Beans are a traditional side dish in Portugal, especially for pork and beef. Whenever I visit my parents, I place an order for these well in advance, because no one makes them better than Momma Leite. But we ignore the side-dish rule and eat them by the bowlful for Sunday supper. Heat a large pot over medium-low heat. Add the bacon and cook, stirring often, until the fat has rendered and the meaty bits are crisp, about 15 minutes. Using a slotted spoon, transfer to paper towels. Bump up the heat to medium, add the chouriço, and sear until lightly browned, 7 to 10 minutes. Transfer the chouriço to paper towels. Pour off all but 3 tablespoons of fat from the pot. Or, if the pot is dry, drizzle in some oil. Add the onions and bay leaf and cook, stirring frequently, until deeply golden brown, 20 to 25 minutes; adjust the heat as necessary to prevent the onions from burning. Add the garlic and paprika and cook for 1 minute more. Drain the beans and dump them into the pot, along with the chouriço, red-pepper flakes, and 3½ cups water. Bring to a boil, reduce the heat to low, cover, and let burble gently, stirring occasionally, until the beans are tender. Begin checking at 45 minutes, but it may take as long as 1½ hours, depending on your beans; add more water if needed. Fish out and toss the bay leaf. Stir in the tomato paste and bacon and simmer for 10 minutes to thicken the cooking liquid. Season with salt and pepper to taste. Let the beans sit, uncovered, for 10 minutes to absorb any excess liquid. Scoop the beans into a serving dish and shower with parsley. For a vegetarian version, omit the bacon and chouriço and use 3 Tablespoons olive oil to cook the onions.